Over 55 years of experience in building ovens for the industry has given us the know-how to build a perfectly balanced modular oven. Sleek European design suggests high technology coupled with unadulterated clean lines. The new Modulux oven is a baker's dream that bakes perfectly from top to bottom and front to back. 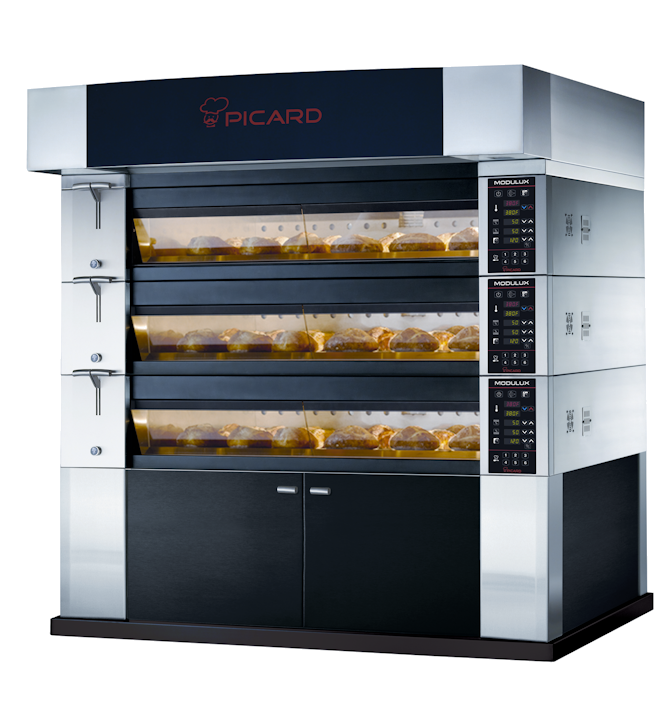 The Modulux Oven A stackable modular design concept with completely independent decks. You choose the number of ovens in consequence to your production needs: 1, 2, 3 or 4 decks. Use only the number of decks you need for your day's production. You'll appreciate the savings this can bring you. Particularly exceptional for baking artisan bread because of its baking stone hearth with a powerful integrated self generating steam system. The Modulux is also well suited for pastries and many other prepared foods; outstanding because you have perfect control over the heating elements heat intensity from both top and bottom. Whatever products you are baking, they'll be perfect every time. The Modulux Line-Up Models Pans Mod32 3 Mod42 4.